Here’s something funny about the mole people who live in New York’s subway system. You’d think they would be weird antisocial types, but they’re not. Together, they’ve constructed this amazing underground city using just things they’ve found on the street and the electricity that runs the subway system. For example, this evening our host, Martha, made my brother, Frank, and me some excellent English-muffin pizzas for dinner—using a toaster oven she found in a trash can at the Times Square station. Hands down, these were the best English-muffin pizzas I’ve ever had. Better than anything Frank’s ever made me, with the benefit of a full kitchen and fresh ingredients from the grocery store. Frank here. I would use this opportunity, Joe, to dog your cooking, too—if you had ever cooked anything in your entire life. Touché, Frank. In any case, on a typical Friday night in May, my brother and I found ourselves in black pants and black hooded sweatshirts, soot rubbed all over our faces to cut down on glare, and crouched in an unused subway tunnel just south of City Hall station in Manhattan. We were on the lookout for M3, which is the code name for the secret money train that runs the whole system at night, collecting money from the MetroCard machines and ferrying it to an office in Brooklyn. For the last month, large amounts of money had mysteriously gone missing off the money train. This was pretty weird, see, because the money train travels with an insane amount of security. Think about it: If you had to transfer money through the New York subway system—which never shuts down, by the way, so there are always passengers waiting in every station—wouldn’t you be super careful about it? That’s why M3 is a state-of-the-art vehicle. It’s completely computerized—there’s no way you’re getting near that thing without twenty different security codes. Plus, it travels with at least two security guards. I’m just saying, if you’re thinking of ripping off the New York subway to buy an Xbox or something, you might want to come up with an easier plan. But the weird thing was, someone was ripping off the New York subway. Which meant someone had devised a way past all the security to get to that cold hard cash. And after two long weeks spending our nights in the dark tunnels below New York—while our mom and aunt Trudy thought we were house-sitting for a co-worker of my dad’s—we’d fingered a likely culprit. Doug LaFayne, a middle-aged janitor at the City Hall station, was a secret computer genius. And Frank and I were pretty sure that after twenty years on the job, he’d devised a way to outsmart M3. “Here it comes,” whispered Frank, as the familiar whine and squeak of a train approaching at slow speed filled the tunnel. We both turned around: Sure enough, the shining silver, ultra-armored M3 was slowly pulling into the station. I turned back to face the platform at the station. Sure enough, Doug LaFayne was loitering there, lazily pushing a mop around the tiled floor—but really, his attention was focused on a tiny controller device fastened to his wrist. The train pulled into the station and stopped without making a sound—a rarity among New York subway trains, believe me. Frank and I had learned real fast that earplugs were a necessity in these tunnels. After a few seconds, a door in the middle of the train opened, and three people got out—the MTA officer in charge of emptying the machines, one guard to follow her to the machines, and one guard to stand at the entrance to the train. Doug perked up, silently watching the officer and the guard walk through the turnstiles to the MetroCard machines. Sure enough, as soon as they were through the turnstiles, his right hand moved to the controller on his wrist. He began typing. Frank and I had discerned that he’d written a code to override the lock on a trapdoor that led from the bottom of M3 to the tracks below. By hacking into the train’s security system and entering a simple four digit code, Doug had gained access to the money train. The next part, though, was what was truly amazing: Doug pushed a button on the controller, then made a big show of pushing around his mop, like he couldn’t care less about the money train. Meanwhile, a tiny robot that Doug had installed in the space between the tracks and the platform sprang to life. It slid into the tiny space beneath the train, raised up, and entered the trapdoor in the M3’s floor. Then it simply reached out a pair of electronic arms, grabbed a bin full of bags of change and bills, and pulled it out of the train and onto the tracks below. With the flick of another button, Doug commanded the robot to push the money into a barely visible space beneath the platform. Then the robot folded itself back up and settled into the same tiny space. Doug entered his four-digit code again, and the trapdoor locked back up. Easy peasy. It was a pretty impressive operation, and in my opinion, it made Doug LaFayne an A-level Crazy Computer Genius. The thing about Crazy Computer Geniuses, though, is that once they get a taste of crime, they can turn very, very dangerous. That’s why Frank and I were going to take down Doug tonight. The MTA officer finished emptying the three machines, and the security guard trailed her back to the M3. The security guard who’d been guarding the door stepped aside, and together, all three boarded the train again. The door closed behind them, the air brakes huffed quietly, and the train pulled silently back into the tunnel. As Frank and I had been instructed, we sat perfectly still in the tunnel, waiting patiently. It was only a couple minutes before Doug glanced curiously after the train, looked around the empty station, and dropped his mop. Without a word, he ran over to the edge of the platform, knelt down, and swung himself down onto the tracks. With the expert air of someone who’d done this a hundred times, he walked right over to his hiding place and pulled the plastic bin from its space beneath the platform. When he saw that the bin was filled to the brim with zippered bags of cash, he grinned. Opening one up, he pulled out a roll of twenty-dollar bills and let out a low whistle. Funny thing about crooks. No matter how much money they’ve stolen, it’s never enough. I glanced at Frank and he nodded. This was our cue. Scrambling from our hiding space, we launched ourselves over to the live track where Doug stood, careful to avoid the electrified third rail—the train’s main source of power and a current so strong it could fry an adult in about thirty seconds. Doug startled the minute we started running, but he still wasn’t prepared for the wrath of two well-trained ATAC agents. “Hold it right there!” Frank shouted, and Doug grabbed the platform, trying to scramble up, but I grabbed his leg before he could. Just then, two uniformed NYPD officers came running down the stairs to the station. They’d been waiting outside for their cue to provide Frank and me with backup. I shoved Doug against the edge of the platform, sure that the cops would reach us before he’d be able to squirm away, but then something unexpected happened. Doug reached down to his controller and typed in a series of numbers. The entrance the cops were heading toward wasn’t a main entrance to the station. That meant that instead of entering via turnstile, the cops would have to scan their MetroCards and push their way through a heavy revolving gate. But as Frank and I watched, astonished, the cops scanned their cards and then shoved heavily into the gate—which didn’t even budge. The main entrance to the station had turnstiles. Even if they were locked, the cops could jump over them. Thousands of fare dodgers over the years had risked the wrath of station agents to enter the subway this way. But the main entrance was a good two blocks from the entrance the cops had tried to use. That meant a delay of a minute or two—which could be just enough to derail our mission. Seeing the cops outsmarted seemed to give Doug an extra jolt of energy. He bucked hard against me, pushing me back from the platform just enough to allow him to reach into his pocket. Before I could wonder what he was reaching for, I heard a sharp Bzzzzt! and Frank screamed. My brother never screams. I turned just in time to see my brother falling away from Doug, who triumphantly held out a Taser. He’d Tased my brother! And now Frank was falling . . . oh no. I sprang into action, grabbing my brother’s limp, trembling body and shoving him back before he landed on the third rail. I can’t lie; I was furious. Normally Frank and I are pretty good at concealing our emotions during ATAC missions, but this guy had just Tased my bro. Making sure that Frank was positioned safely—not near the third rail—I lunged at Doug, easily knocking the Taser out of his hand. I shoved him back toward the platform, trying to force his head down onto the dirty platform surface. But he reared back with a surprising amount of strength, sharply elbowing me in the face. Ouch! Okay, now I was really getting perturbed. At first, I have to admit, I was kind of impressed by Doug—I mean, not everyone can build a money-train-thieving robot. But now he just seemed like every other selfish, dim-witted crook we’d battled over the last few months. And he was going down. Now. I swung hard, landing a solid punch to the back of his head. He groaned and pitched forward, but he quickly used the space he’d gained to swivel around and land a sharp blow to my stomach. I tried to dart away, as we’d been trained in basic self-defense, but he still got me pretty good, and I doubled over. He moved even closer, reeling back to punch me again, but then we heard a noise coming from the tunnel. My heart pounded hard in my chest. Frank! I had enough time to get away, but more importantly, I had to get my brother off the tracks. Giving Doug a quick shove to give myself some space, I turned and knelt beside Frank, carefully lifting him under the shoulders and knees. I struggled under his weight to get to the platform and gently placed him on the waist-high lip, then placed my hands on the edge and carefully vaulted myself off the tracks. Safely on the platform, I grabbed Frank’s semiconscious body and pushed him back from the tracks, well out of the way of the train and any departing passengers. All of this transpired in about ten seconds. When I turned back, Doug was holding his bin full of money, frantically reaching down to pick up a few bags that had fallen onto the tracks. The train was approaching, but slowly—the subway trains often moved more slowly at night, I’d learned. It creaked around the corner of the tunnel, its bright headlights suddenly flooding the tracks with light. I looked down at Doug, my heart beating hard. The cops still weren’t here. And right now, the smartest thing for him to do would be to run away from me—through the dividers to the uptown tracks, then over and up onto that platform and out the exit. Once the oncoming train pulled into the station, it would block me, and I wouldn’t be able to follow him. I could go aboveground, but there were so many exits, it would be nearly impossible to catch him that way. Making a split-second decision, I leaped down from the platform, aiming right for Doug, tackling him onto the tracks. The train blared its horn, and my heart beat faster; I knew it was too late for a train going at that speed to stop. Pushing him down, I wrestled the bin from his hands, shoving it beneath the platform where it wouldn’t impede the train. Then I grabbed his wrists and shoved them down. Climbing lengthwise on top of him, I tried to push both of our bodies as far down into the track bed as I could. The train was just feet away. I pushed my face down into the space of Doug’s neck, smelling the dirt and fetid water of the track bed. The train ran over us swiftly. One minute there was the bright light of the headlights and lots of track space on either side; the next we were confined in a tiny, tomblike space between the bottom of the train, its wheels, and the track bed. Doug whimpered, and again I urged, “Don’t move. It’s over, Doug. You’re caught.” The train wheezed to a stop, and I heard the brakes engage. There were a few moments of silence before I heard footsteps scrambling down the steps and over the turnstiles. “We’re under the train!” I screamed. There was a pause. “Under the train?” the cop asked. I laughed. I knew it would be a good while before the cops got us out from under this train, but it was worth it. 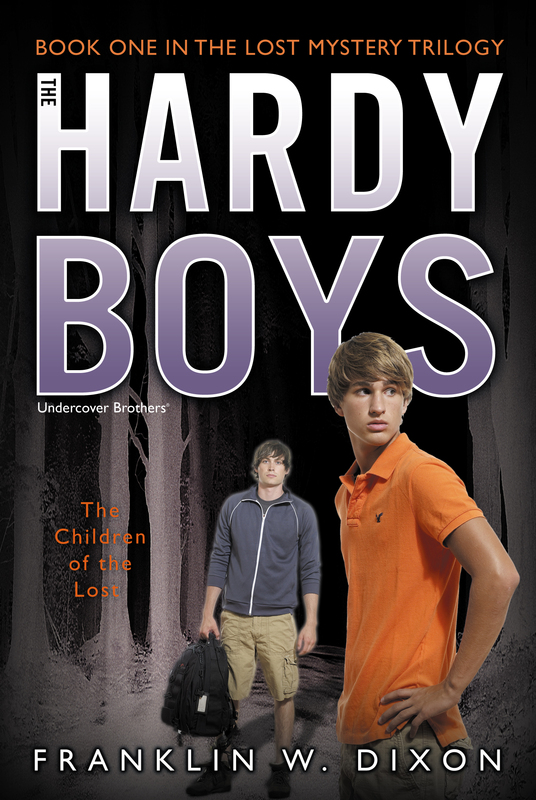 After all, the Hardy Boys always get their man.